The purpose of this project was to create a practical, modern, easy-care, economical kitchen where it would be fun to cook, entertain and to keep everything stored and tucked away. The gray counters are laminate with a beautiful aluminum edge. Stainless steel tiles are mixture of brushed and shiny squares. 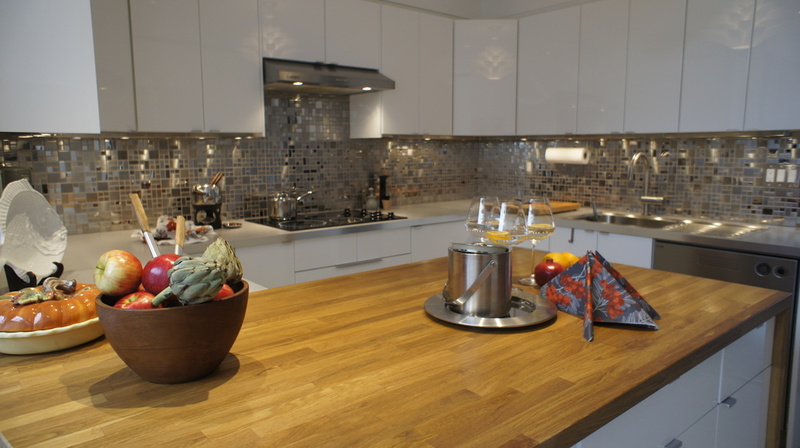 The gray counters are laminate with a beautiful aluminum edge. Stainless steel tiles are mixture of brushed and shiny squares. The client invested in top-quality appliances. The floating, white cork flooring is good to stand on and great to take care of.